One Saturday afternoon as my husband and I were hanging around at home he suddenly said he wanted to find a new place to go out for dinner that night. I told him to go for it, find some place new and interesting, get some reservations and we’d go. So, he started searching around the internet. A while later he came back to me and told me he’d found a place. But he warned me it was a bit different and he admitted that this would probably be a place that he would like more than I would, but he was super excited about it and really wanted to go. After I made sure there would be something one the menu that I could order, I told him to get reservations and we’d head down to Garden Grove. Admittedly, Downtown Garden Grove isn’t a place I think I’ve ever been, nor would I think there’d be going there to dine at a top-rated eatery. The Globe – Belgian GastroPub was my husband’s selection for dinner. Part restaurant, part bar, all European charm and amazing Belgian beers, this place piqued my husband’s interest. Belgium has always been known for its terrific beers, and about 6 months earlier after my husband tried a new-to-him Belgian beer at a local restaurant we dined at, he’s been really into Belgian beers, and this beer in particular. So, when my husband read about a Belgian gastropub that specializes on Belgian beers on tap, including the kind he really likes, he couldn’t resist. Owned by a Belgian couple, The Globe has Belgian and European beers on tap that you just can’t find anywhere else as well as serving authentic Belgian food. Additionally, the chef features a different European country each month and highlights favorite foods of that country to serve on the menu. This should be an experience to remember. There was no way that my husband was going to a Belgian gastropub without trying some of their Belgian beers. Instead of being forced to choose just one type of beer on tap my husband decided to order a tasting flight which came with 4 different beers on tap. 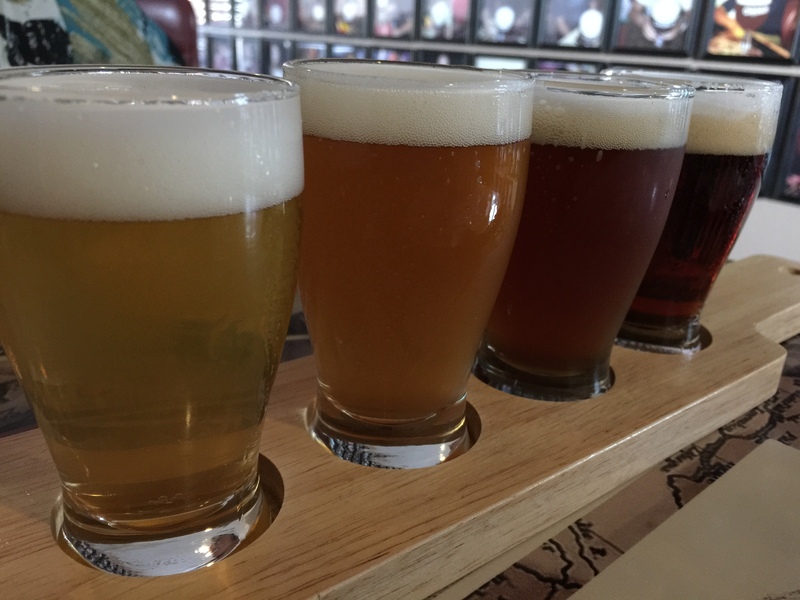 If you know what you want, you can choose the 4 different beers that come in the tasting flight. However, my husband wanted to be surprised, especially since they had so many different beers on tap that he’d never heard of or tried before, so he asked them to just pick 4 beers for him, but told them that at least one of the beers had to be Chimay. Chimay Brewery, a popular beer brewery in Southern Belgium is one of only 11 breweries in the world to brew beer crafted by Trappist monks. Bottled Chimay Blue is the first Chimay ale that my husband tasted and enjoyed and was the main reason why he wanted to come to The Globe because they had Chimay on tap. So, a few minutes later, a tasting flight of 4 different Belgian beers was put on the table before my husband and he was given a little description of what everything was. If I have it correct, from left to right above the different beers are: Tripel Karmeliet, Chimay White, Chimay Red and Grimbergen Dubbel. After tasting all 4 beers, my husband’s favorites were the Tripel Karmeliet and the Chimay Red. The Grimebergen Dubbel my husband described as just being a little different. The Chimay White was a little weak on its own, but he later discovered that it paired really well with the food that we ordered because the food helps to open up the flavor of the beer. 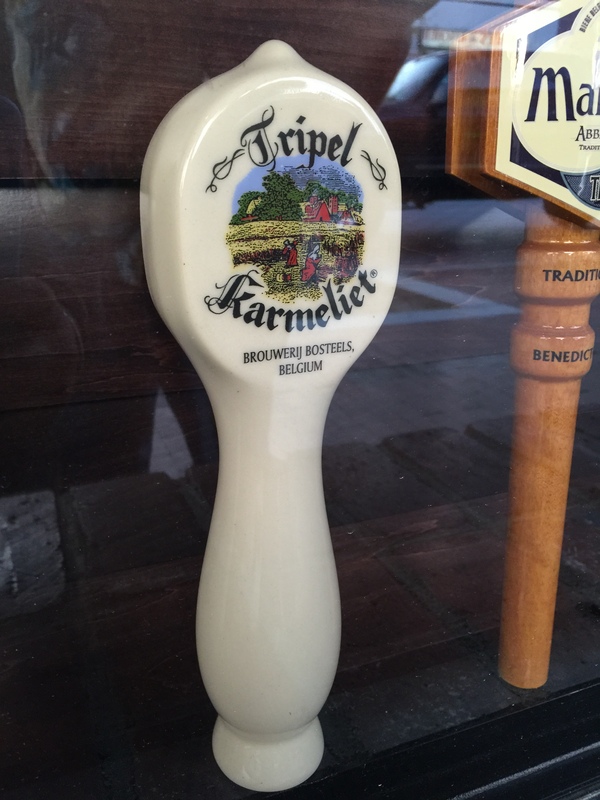 My husband was quite surprised that he enjoyed the Tripel Karmeliet because he doesn’t normally enjoy light beers and this was the lightest of the beers in the tasting flight. He thought that the Tripel was quite tasty and that the beer had great aroma. While the Tripel appeared to be light, he said that it definitely wasn’t light in taste and actually had a little bit of a fruity note to it. However, his favorite beer of the tasting flight was the Chimay Red, or properly known as the Chimay Rouge. 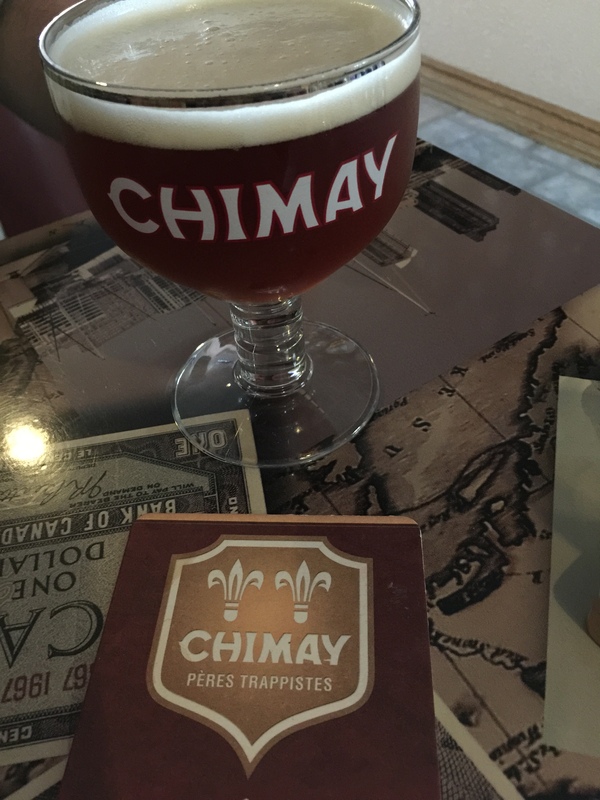 While my husband had only ever tasted the Chimay Blue before, he said that the flavors of the Chimay Red were most familiar to him and the reason he enjoyed Chimay in the first place. Chimay was the first Trappist brewery to use the Trappist ale designation on its labels and is today, the most well known of the Trappist ales. Today, Chimay widely distributes 3 different kinds of ales worldwide: Chimay Rouge, Chimay Bleue, and Chimay Blanche. While Chimay Blue is now served on tap, if you can find it, at the time we went to the Globe, Chimay Blue only came in bottles, so he went with the next best thing, Chimay Red. Because my husband enjoyed Chimay Red so much, he decided to order a pint of it on its own. I was jealous of the terrific pint glass that the Chimay is served in and wanted to find out how I could get my hands on a set of these glasses myself. As I said, The Globe isn’t just a pub, it also serves terrific, authentic Belgian food. To add to the European vibe and atmosphere, the chef selects a different European country each month and features a few favorite foods of that country to add to the menu. The month we visited The Globe, the featured European country was Spain. 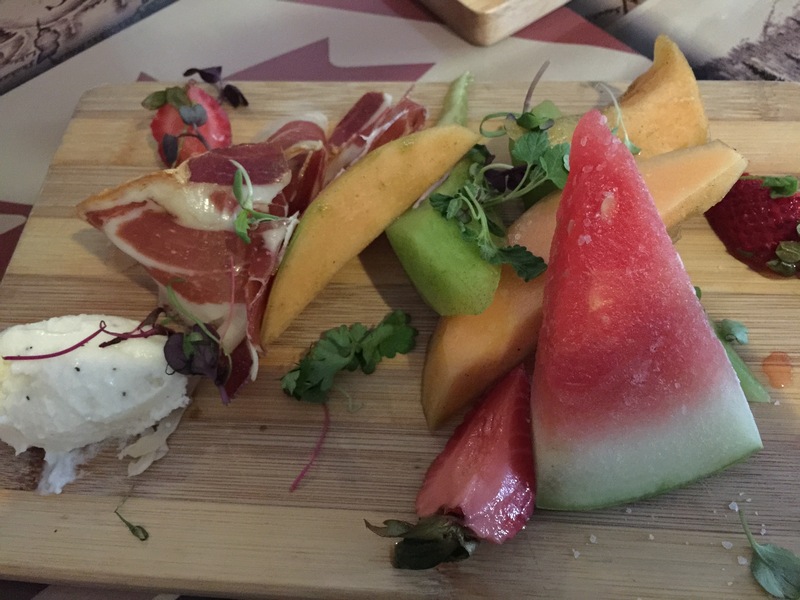 One of the appetizers on the menu featuring the cuisine of Spain was the jamon Serrano and melons. We had to give it a try. Served with basil infused compressed melons, pickled strawberries, Serrano ham and macho mousse, this dish was excellent. I’ve had Spanish ham and melons before, but not like this. The treatment of the basil infused compressed melons and pickled strawberries really sent this dish over the top. The pairing of the terrific Serrano ham with its slight saltiness and the basil infused flavor of the sweet cantaloupe, or honeydew or watermelon was just fantastic. A little salty, a little sweet, a little herby. My husband really enjoyed the manchego mousse. It wasn’t like just having ham, cheese and melons. The manchego was whipped into a soft cream cheese-like substance that you could kind of spread over the melon that just gave off this tangy flavor. The manchego mousse with the pickled strawberry was a combination that my husband really liked, the vinegar tang of the pickling, the sweetness of the ripe strawberry and the tang of the manchego mousse just created great flavors. Our other appetizer was skirt steak florets. Made with Gorgonzola cheese, caramelized onions all in a red wine demi-glace, the steak florets were incredibly flavorful. I think it was this appetizer that really brought out the flavor of the Chimay White that my husband was sampling. The dish was much more savory than I had expected, with such a bold and strong sauce for the steak. 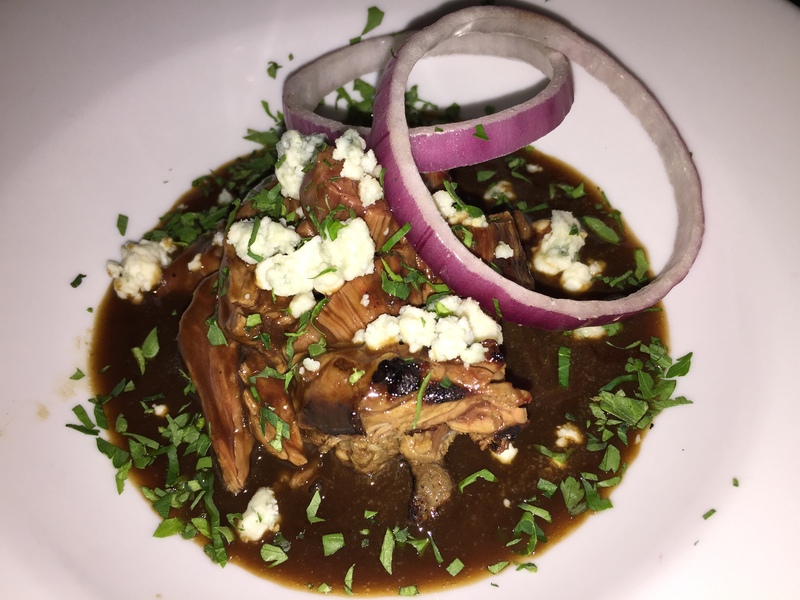 The meat was tender and well cooked, but I think it was the tang and creaminess of the Gorgonzola cheese that really added that extra little oomph to the dish and brought it all together. For our meal, my husband and I both ordered the aged cheddar bacon burger. Ok, not exactly a Belgian or Spanish dish, but it was appealing to both of us. Made with a house blend of chuck and dry-aged beef, aged cheddar, bacon, lettuce, tomato, onion and garlic aioli all on a toasted brioche roll. The burger is, however, served with Belgian frites, which are so different than the normal fries we all know of. First off, the burger was terrific and incredibly filling. The combination of chuck and dry-aged beef was really flavorful. It’s one of those burgers where you can really taste the meatiness, and that’s terrific. 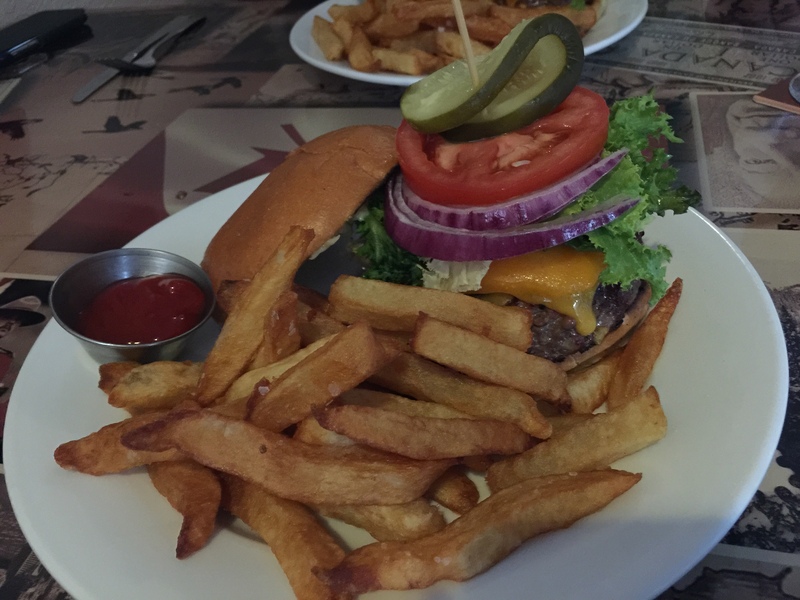 The aged cheddar was quite sharp and incredibly noticeable on the burger. Sometimes burgers are advertised with sharp or very sharp cheddar and I always feel like I can never distinguish the cheese from anything else on the burger. However, on this burger with the aged cheddar, you could really taste the sharpness of it, and it was fantastic. Now the fries, my husband thought that the fries were the best part of the meal. Generally, my husband isn’t a fan of thicker-cut steak fries, but in this case, since they were Belgian frites, he loved them. Belgian frites are fried twice, once to cook and soften up the potato, the second time to give it crispiness on the outside. These were outstanding fries, or frites, as you’d call them. By the end of the meal, my husband and I were pretty full, and we were actually going to skip dessert until they brought a dessert tray out to the table and we saw a dessert we just couldn’t resist. Belgian Liege waffle with ice cream. If you’re going to go to a Belgian gastropub, you might as well go all the way and take advantage of the Belgian dessert. Where else are my husband and I going to be able to go out and have a Belgian Liege waffle for dessert? Served with some whip cream, strawberry sauce, powered sugar and scoop of vanilla ice cream, the dessert was terrific. 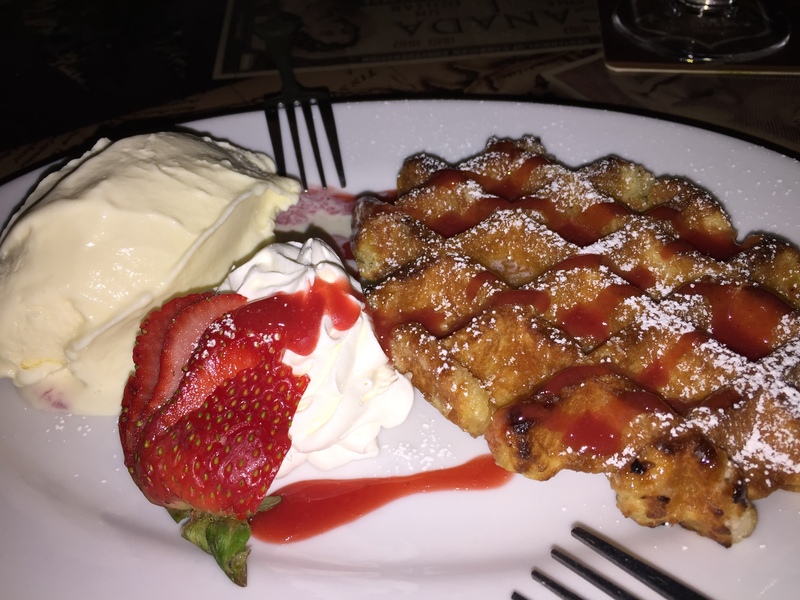 The Belgian Liege waffle was crunchy on the outside and soft and doughy on the inside. The waffle was a little sweet, but not overly sweet, so it went well with the ice cream, which added the needed sweetness for this to be a dessert. The strawberry sauce was a nice sweet-tart pairing to go with the crunchy dessert. I was glad that we found just a little bit more of an appetite to be able to order dessert because this was a good one. I was really skeptical at first when my husband told me he wanted to go out to a Belgian gastropub for dinner. This is definitely more his scene than my scene. But I was thoroughly surprised by how much I enjoyed The Globe. The atmosphere was terrific, the food was fantastic. My husband loved the selection of Belgian beer on tap and it was exactly what he was looking for. Being located in downtown Garden Grove, I didn’t expect to find this kind of an establishment, and I’m glad that my husband talked me into giving it a try. This is a place that we’d definitely dine at again. 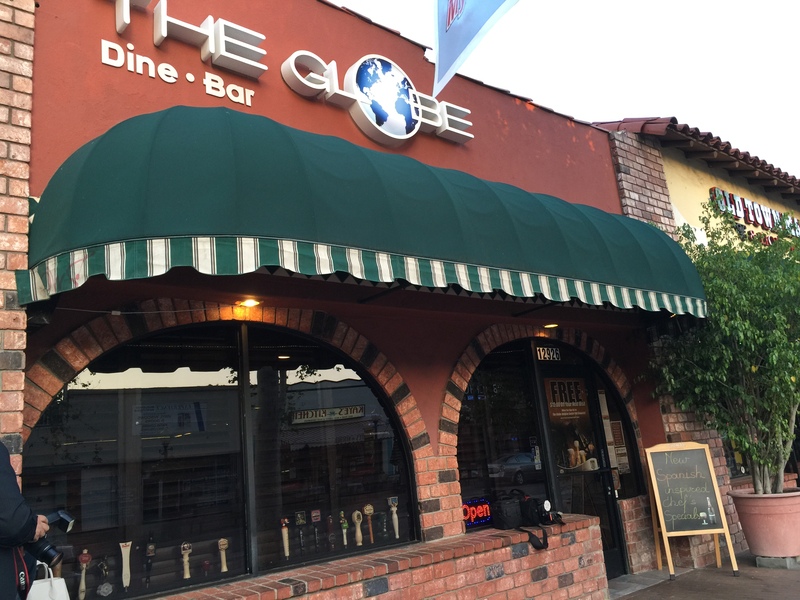 As an update, since we’ve dined at The Globe, after 4 years of operation on Garden Grove’s Main Street, The Globe has temporarily shuttered its operations as it prepares to re-locate into a historic church to become a brewery and gastropub called the New World Abbey. Looking forward to their re-invention.